For all the talk of a real estate boom, Park Slope real estate broker Annie Rose says it is still possible to find a condo in Brooklyn for $55,000; of course, she explains, this is just for your car. Rose's firm began selling spots in its "condo parking garage" after most regular parking garages in the area were closed down and converted into apartments to capitalize on the hot market. The car condos, she says, "are selling like hotcakes." Actual places to live, on the other hand, are selling far better than hotcakes, which have never been as popular in New York as real estate. People should expect to spend $250,000, Rose says, for a studio apartment that five years ago would have cost only $70,000. Across the city, real estate prices are breaking records. Late last year an apartment in Brooklyn Heights sold for $8.5 million, becoming the most expensive home in the borough; several months later, a house on the same block went on the market for $20 million, after the couple who own it claimed to have been offered $10 million for it, in cash. Just last week, Donald Trump -- who for better or worse has become the human embodiment of the city's real estate obsession -- signed a tentative deal to sell a plot of land with three apartment buildings on it for $1.8 billion. It will be the largest residential real estate deal in the city's history, and Trump and his partners are set to receive 18 times what they paid for the land a decade ago. The enthusiasm that some New Yorkers feel for the real estate market is matched only by the anxiety that others feel about its impending bust. New York Magazine recently printed the word "CRASH" across its cover in huge red letters, then spent 13 pages trying to prove the coming of an apocalyptic collapse. Recent worrying comments by officials and industry groups have bolstered the arguments of those sharing this view. It is not only tycoons with a stake; the city itself ties its fortunes to the business of buying, selling and owning its scarce land. 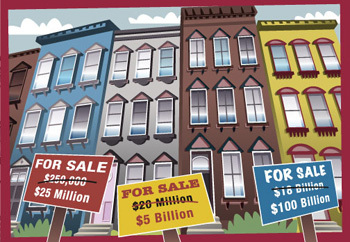 The current market, where more and more properties are being sold at higher and higher prices, has filled the city's coffers: Mayor Michael Bloomberg recently presented a budget with a huge surplus, thanks largely to a spike in real estate-related tax revenues. But soon, the mayor warned, the city will be forced to face the unpleasant reality that the good times can't last forever. "This is one of the things that should concern us," he said of a downturn in the real estate market. "And there's not much we can do about it." All of this is only the latest expression of New York's long fixation on real estate. For many, real estate is the main show in the city. Doubtless, the real estate market looms large in the city's culture and its collective psychology. But how does the real estate market affect the way New Yorkers actually live? How much does the city rely on it economically? And what will happen here if the real estate market does crash? Since then, enormous fortunes to be made in New York City real estate have continued to be the stuff of city lore. “Could I begin life again, knowing what I now know and had money to invest, I would buy every foot of land on the island of Manhattan” said John Jacob Astor, the city’s original real estate mogul, after using the Manhattan real estate investments he did make to become the country’s richest man, America's first millionaire. But the business of real estate in New York is more than just business; in many ways it dictates city politics and defines its culture -- a result, many believe, of the desire to do so much on what is relatively little land. From the proposed basketball arena in Brooklyn to the proposed football stadium on the West Side to the ever-shifting proposals for Ground Zero, many of the hot button political issues of the day revolve around plans to use big chunks of the city’s scarce real estate. The city regularly gives multimillion-dollar subsidies and tax breaks to encourage real estate development. Critics see these deals as accomplishing little more than demonstrating the power that developers have at City Hall. According to one study, property tax exemptions cost the city almost $8 billion last year. “Taking on the real estate industry in New York is like taking on oil in Texas,” said Bettina Damiani of Good Jobs New York, a group which tracks city subsidies to corporations and says it is common for them to end up in the hands of companies who had no plans to develop elsewhere anyway. Peruse the local real-estate ads [when you’re out of town] just to see what kind of mansion your NYC rent could get you in that podunk town. Much more than in other places, New York residents define themselves by their location, said Steven Gaines, author of recently-published book The Sky’s the Limit about the culture of high end real estate in Manhattan. The city itself has good reason to be interested in the real estate market. Revenue from real estate taxes were so large in this year's city budget that they accounted for much of its unexpected $3.3 billion budget surplus. But both the city and independent budget monitors say that this revenue is going to drop off sharply next year, as the number of real estate transactions are expected to decline. The Independent Budget Office predicts (in pdf format) that revenues from the real estate transfer taxes will decrease by 30 percent; largely because of this the city expects a deficit in fiscal year 2007 (which begins in July, 2006) of $4.5 billion. Shifts in the real estate market are likely to affect the city’s tax revenues in other ways as well, most notably in income tax receipts. If the incomes of the 116,000 people working directly in the real estate industry -â€“ and those in various other related industries like construction â€“- were to drop, so would the city's coffers. But, even though almost 40 percent of the city’s tax revenue comes from property taxes, budget experts say this is the one tax that is relatively immune from fluctuations in the real estate market, since the city has caps on how much property tax can increase on small buildings from year to year, and, for larger buildings, calculates the tax based on the average of their assessed value over the previous five years. In other words,the property taxes are insulated from any short-term ups and downs of the market. “Even if you had a total collapse â€“- which we’re not expecting -â€“ it takes several years to work through the system,” said George Sweeting, deputy director of the Independent Budget Office. While taxes like the real estate transfer tax may be more volatile, Sweeting says that the city has prepared itself well for such swings. All in all, experts agree that New York is less reliant on real estate for tax revenues than are many other jurisdictions. Nowhere is the blessing as mixed as in residential real estate. A Boom or a Bubble? High home pricesnationwide have led many to say that there is a speculative bubble in real estate. A bubble is formed by a growing demand for a seemingly good investment, pushing prices up without a corresponding increase in intrinsic value. People buy at inflated prices, believing they’ll be able to sell even higher. This eventually leads to a "price correction," or, in layman's terms, a crash. Throughout history, people have created such bubbles by getting worked into a frenzy and then growing tired of just about everything from Florida swampland to tulips to, recently, technology stocks. Experts who see a real estate bubble cite the disparity between real estate prices and rents and between real estate prices and average income, both particularly pronounced in New York. But others contend that New York’s market is safer because there is less speculation here; it is just too expensive to gamble here. And if it's not a speculative frenzy that is driving up prices, they say, then it must be a combination of nationwide factors such as low interest rates, and local factors such as low crime rates. Jonathan Miller of real estate firm Miller Samuel says that the city’s market is in much better shape by almost every measure than it was during the last boom -â€“ which ended in a serious crash. One big difference, he says, is that in the late 1980s a glut of new luxury housing flooded the market, through new construction and condominium conversions. While the current construction boom does promise to add significantly to the city's housing supply, people in the industry say it will not have the profound effect it did the last time around. "If we have some sort of correction,” said Miller, ”then I think it will be a very soft landing." For those who own property, increased values come with many benefits, including the ability to borrow more money and the option of selling a home at a much higher price than you purchased it. For those who do not own the place they live, however, the real estate boom has been painful. Nationwide, the conventional wisdom is that the current boom is great for the so-called average American. Because homeownership rates are high -- 70 percent of Americans now own their homes -- many people are benefiting. But it is a different story in New York, where only one third of residents own the places in which they live. The demand on housing has pushed vacancy levels down and, consequently, pushed rents up. In a recent New York Times poll, about half of New Yorkers said they paid as much as they could for housing, while about a third said they were paying more than they could afford. Forty percent of renters said they paid too much for housing, about double the percentage of homeowners who felt the same way. The increase in rents is nowhere near as sharp as the increase in home prices. However, as property values increase, owners of apartment buildings have more incentive to renovate their buildings and more money to do so. Both of these trends have led to an increasing number of apartments being taken off the rent regulation rolls, say housing advocates. Landlord groups dispute this, but the Rent Guidelines Board recently reported that there was a net loss of 4,700 rent regulated apartments last year. Michael Clarke’s Prospect Heights apartment was one of those; his monthly rent has gone up $75 since his landlord renovated the building, pricing it out of the program. In the eight months he has looked to buy an apartment, Clarke has been shocked by how little he can actually afford. For the $200,000 that gets him a studio apartment in New York, he says, he can get a house with a yard in Atlanta, which he says is full of ex-New Yorkers anyway. He’s planning to move once he graduates. ARE WE IN A BUBBLE THAT WILL BURST? Clarke says that he can’t imagine that the real estate market will become affordable in time for him to change his mind. It does look like the momentum is only pushing the market up further. Miller Samuel, a real estate appraisal firm that does a quarterly survey of Manhattan co-ops and condos, found in its most recent report that records were broken in every category (in pdf format). The average condominium in Manhattan is now worth $1.2 million, more than double the average price from five years ago. While the absolute numbers are not as extreme in other boroughs, the trends are headed in the same direction. But in New York and across the country, there is increasing talk of a real estate bubble, a market where what Alan Greenspan once referred to as “irrational exuberance” drives up prices. Once formed, such bubbles are prone to pop, sending prices plummeting. New York’s market is especially prone to soaring and diving, which economists say is a result of little developable land and significant political barriers to building. The last time the market crashed, in the late 1980s, median co-op and condominium values in Manhattan dropped by 47 percent over seven years, leaving an unmistakable mark on the city. "Construction stopped, people lost bunches of money, values went way down, and mayors didn't get reelected,” said Brendan O’Flaherty, a professor at Columbia University’s business school. Economists debate whether the current market is a bubble, or what it would look like if it did burst [see sidebar for more on this debate]. On both a national and a local level, the effects of a true crash in the housing market would be severe. “If there is a residential real estate bubble that bursts, that creates problems for a lot of individuals," said Parrott of the Fiscal Policy Institute. However, he said, if the market didn't burst but just... slowed down, "that would be a good thing." The Real Estate Boom -- Or is it a Bubble?